"This has all the flavor and heartiness of a great samosa without the frying. Although this is an easier, healthier version of the fried samosa, it tastes very authentic. This recipe has the added advantage that you can make ahead and freeze uncooked samosas, simply skip the egg brushing, freeze until you're ready and cook at 350 degrees F (175 degrees C) for 25 to 30 minutes. Serve warm, plain, or with chutney." Place potatoes into a large pot and cover with salted water; bring to a boil. Reduce heat to medium-low and simmer until tender, about 20 minutes. Drain and transfer potatoes to a bowl; coarsely mash. Heat oil in a skillet over medium-high heat; cook and stir onions, coriander seed, curry powder, ginger, salt, turmeric, cumin, allspice, cayenne pepper, and cinnamon until onion is lightly browned, about 5 minutes. Remove skillet from heat and stir tomatoes and peas into onion mixture; pour into mashed potatoes and thoroughly mix. Cool completely. Cut each pie crust into 8 even triangles. Spoon filling onto the wide end of each triangle; fold corners over filling creating a triangular 'hat' shape. Pinch the dough together to form a seal. Brush egg white over each samosa and arrange on a baking sheet. Bake in the preheated oven until samosas are golden brown, about 15 minutes. Bad recipe. Tomatoes don't belong in Samosas. Pie crust was too heavy also. Waste of product and time. 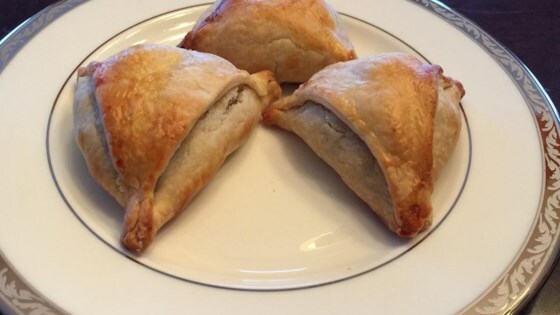 I used egg roll wrappers instead of pie crust to keep the calories down, and brushed them with oil. Very good! Excellent flavor. Takes a little while and creativity to make (putting them together) but totally worth it. Brought them to a New Years Indian themed meal and they were a hit with all ages! I made this to go with chicken tandoori, Indian carrot rice, mango chutney and pistachio rose ice cream. I have to say this was very tasty and a big hit! My family asked for seconds. This recipes is great. I used sweet potatoes instead of regular potatoes and they were delicious. Great recipe and easy. Just takes time to assemble the samosas.